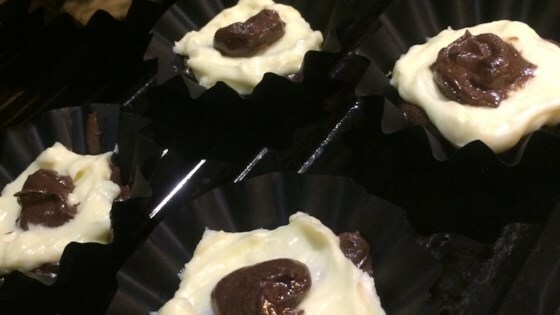 "Kind of like cheesecake-swirled brownies but made in cupcake cups. Easy to make with package brownie mix. Also cheesecake mix doesn't contain eggs." Mix brownie mix, oil, eggs, and water together in a bowl until well combined. Mix cream cheese, sugar, butter, flour, and vanilla extract together in a separate bowl. Fill each muffin cup 1/2-full with brownie mix; top with cream cheese mixture. Spoon brownie mix over cream cheese mixture layer. Bake in the preheated oven until a toothpick inserted in the center of the brownie part comes out clean, 20 to 25 minutes. This delicious, slightly decadent cheesecake is a snap to make. Not all the brownies will be used in the cupcakes. The nutrition data for this recipe includes the full amount for the brownies. The actual amount of brownies consumed will vary. The directions given for the brownie mix are according to the Pillsbury® mix. Follow directions on brownie box if using a different brand. This recipe was great. I should've doubled it! We just used our homemade brownie recipe and it worked out well. I will definitely make these again! I made it exactly as directed and everyone went crazy for it. Good recipe! I added one egg to the cheesecake batter to thin it out.